An 88 year old woman was killed in a car accident in Queens, New York. The woman was driving North on Cross Bay Blvd at Liberty Ave when she hit a pillar of the elevated A line subway train tracks. She suffered critical injuries and died 4 days later at the Hospital. The Police are still investigating the cause of the crash. 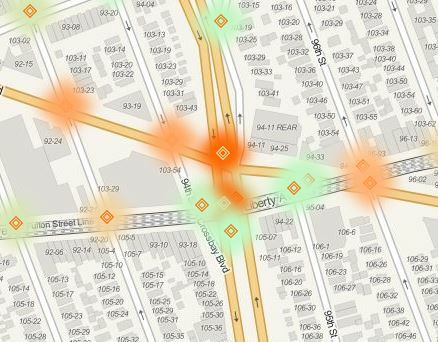 The NYC Crash mapper heat map shows that the area is a dangerous spot where many accidents have occurred in the past. Between August 2011 and February 2014 44 collisions happened there and 5 pedestrians, 1 cyclist 4 passengers and 5 drivers suffered personal injury.